Employee engagement versus employee satisfaction are too often confused terms. 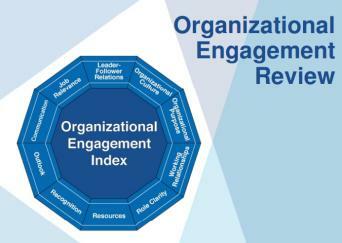 The Engagement Index presented in the Organizational Engagement Review is a composite measure of factors that research shows may impact the alignment of individual effort with the organization’s strategic objectives. Measuring engagement is a very effective way to determine motivations within an organization. The Organizational Engagement Index is a well researched assessment tool which can provide organizations with great insights that can help drive improved performance and engagement. It is very commonplace for organizations to run an annual employee engagement survey. Unfortunately many of these tools aim to measure employee satisfaction rather than engagement. There is a big difference between employee satisfaction and employee engagement. Satisfaction is often related to hygiene factors where as engagement is linked to the employees connection with the strategy, mission and vision of an organization. Groove Management's Organizational Engagement Review is focused on the connection between the workforce and the business strategy. Our assessment tool will provide your leadership team with a clear understanding of your workforce's level of engagement and can be bench marked against other organizations in similar industries. Measuring engagement in small to mid-size organizations is as important or even more important than in larger organizations. Too many survey tools are focused on the enterprise space. The Organizational Engagement Review is different. It is best suited for organizations with under 200 employees. While the tool can be deployed in larger organizations, our sweet spot is smaller companies. To learn more about our Organizational Engagement Review as well as our programs to drive employee engagement, reach out to Groove Management.